The Original Teddy Bear Team Building Event! This is an indoor program. We need enough space to comfortably host a table and chairs for each team and some banquet tables for our supplies. The Team Teddy Rescue Bear program is a charitable and fun way to bond a team. Each team has puzzles to solve, codes to decipher, and secrets to unlock to acquire the resources that they need to build a series of custom teddy bears. Participants divide into small work teams. Each group must complete a series of games/challenges to earn team points. In the final half hour, teams use their accumulated points to purchase all parts and accessories necessary to build a high-quality teddy bear. 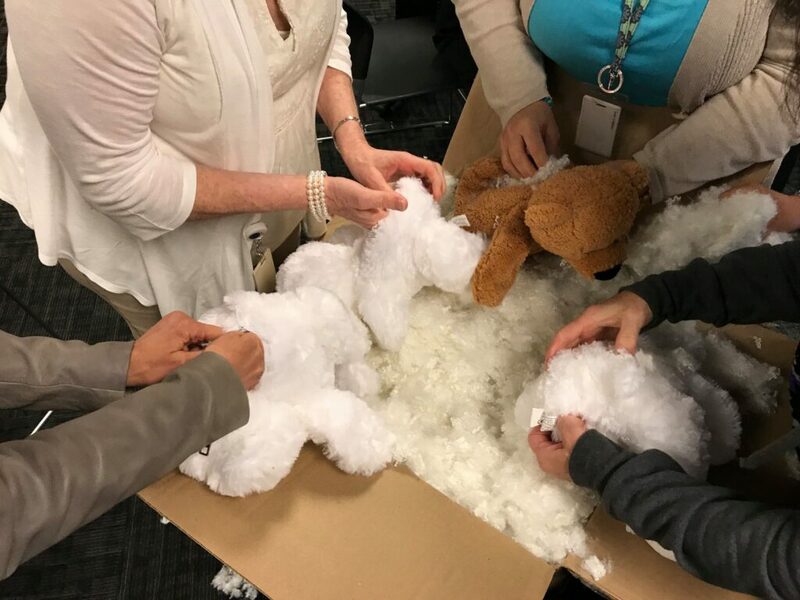 Teams will be assembling bears of their choice by carefully stuffing them to huggable perfection. Once these furry friends are created, they are dressed in a variety of fun outfits giving them an identity of their own. Turning these bears into a toy for a child can be incredibly rewarding, the greatest challenge is to let go of these cute little ones when you have put much effort into its creation. This teddy bear charity challenge is fun and altruistic. It benefits your team and the children who receive the teddy bears and blankets. It’s a win-win team building event. The possibilities are endless, but the outcome is always the same – a group of happy children and a proud team of employees. Kevin and the program were a huge success. It was exactly what we needed. He had a great energy and kept things moving along. We were thrilled to get a representative from Ronald McDonald house to accept the teddy bears. It really made the whole project perfect. The girls had a wonderful time. They learned how to work together in a fun environment. Our team leader, Monica, worked very well with the team. The Team Teddy program was amazing! We bonded as a team, learned better communication skills, celebrated our achievements, and had lots of FUN while giving back to the community. The facilitators kept us on track, celebrated our wins, and genuinely cared about our success. The team was raving about the experience and we've already recommended it to other teams. Well done! Everyone was so excited to make the bears! We all had a lot of fun. The participants were even more excited to know that the bears were going to children that would be really appreciate them. The best Team Building activity we've ever done. TeamBonding was flexible and helped us schedule an activity at the last minute. They were very cooperative and the facilitators were down-to-earth and personable. We did the Teddy Rescue Bear (Build a Teddy Bear) activity and it was lots of fun. I would definitely do it again or try one of the other activities. The best parts are the games, puzzles, and trivia you have to complete to gain experience for the specific activity. "Thank you for facilitating our staff retreat. The staff really enjoyed building the bears. The team building activities gave everyone a chance to get to know and understand each other better, and we look forward to capitalizing on that with better communication and teamwork back at the facilities. " As an administrative assistant, I usually make plans for events at locations that I do not attend. Therefore, I am very reliant on the confidence that I have in the people I deal with when making plans for administrators and staff. The contact that I had with TeamBonding from the beginning of planning our event to the execution of the day for our Administrators was excellent. All of my questions and concerns were addressed immediately and the day was a wonderful and inspiring event for our staff.